Part Used: The gum-resin is gathered in spring or summer, after the bark of the tree is cut. Then the gum-resin is fried. 1. To invigorate blood and stop pain. 1. Pains caused by blood stagnation: a) dysmenorrheaFrankincense (Ruxiang) is used with Chinese angelica root (Danggui), Chuanxiong rhizome (Chuanxiong) and Cyperus tuber (Xiangfu). b) stomach painFrankincense (Ruxiang) is used with Sichuan chinaberry (Chuanlianzi) and Corydalis tuber (Yanhusuo). c) general pain or joint pain due to invasion of wind-cold-damp. 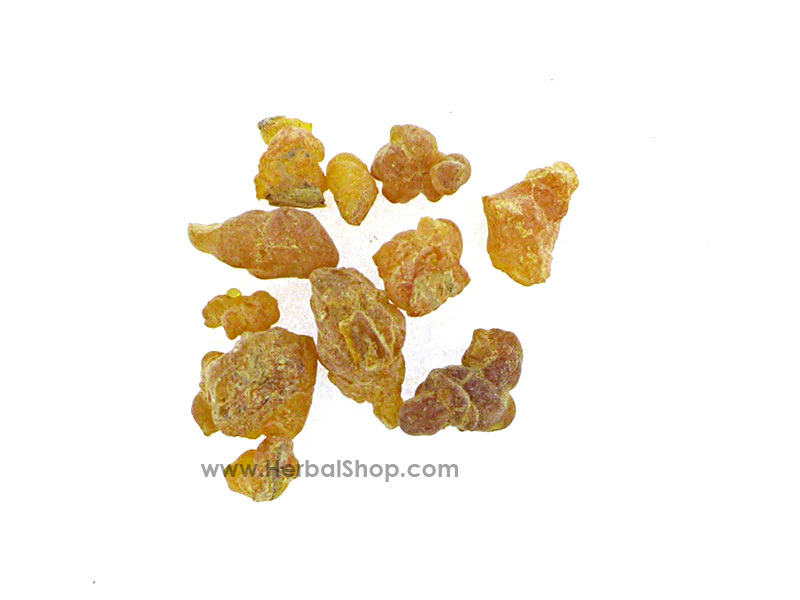 Frankincense (Ruxiang) is used with Notopterygium root (Qianghuo), Futokadsura stem (Haifengteng), Large-leaf gentian root (Qinjiao), Chinese angelica root (Danggui) and Chuanxiong rhizome (Chuanxiong) in the formula Juanbi Tang. d) pains caused by external injuriesFrankincense (Ruxiang) is used with Myrrh (Moyao), Dragon’s blood (Xuejie) and Safflower (Honghua) in the formula Qili San. e) pain from carbuncles and furuncles with swellingFrankincense (Ruxiang) is used with Myrrh (Moyao), Red peony (Chishao) and Honeysuckle flower (Jinyinhua) in the formula Xianfang Huoming Yin. 2. Boils and ulcers . The powders of Frankincense (Ruxiang) and Myrrh (Moyao) are used externally. The combination is called Haifu San.